Another busy month has flown by, and we’re excited to bring you the new features and updates to Receipt Bank! Read on to find the full breakdown of each feature release to help make your bookkeeping even more effortless. We’ve updated the receipt details screen to give you greater visibility when working on your clients’ accounts. You can now see the publish destination of the receipt at the bottom of the page, making it easier to locate your items within your accountancy software. For your sole trader clients, we’ve made it even easier to invite them to our easy-to-use extraction app. When adding a new user, select 1tap - our app specially designed for non-VAT registered sole traders. A unique code will be ready and waiting for your client in their account. This makes straightforward for you and your 1tap clients to get started! We understand the importance of efficiency, which is why we are always trying to improve the way our product works. We have made a second update to the inbox (see the details for the first update here). Now, when you sort your inbox, the order will remain the same when working between two tabs. For example if you sort the supplier names A-Z and move from the ‘Inbox’ tab to the ‘Archived’ tab, the supplier names will remain being sorted from A-Z. This update should allow you to work more freely and quickly between multiple tabs - saving you time and effort. 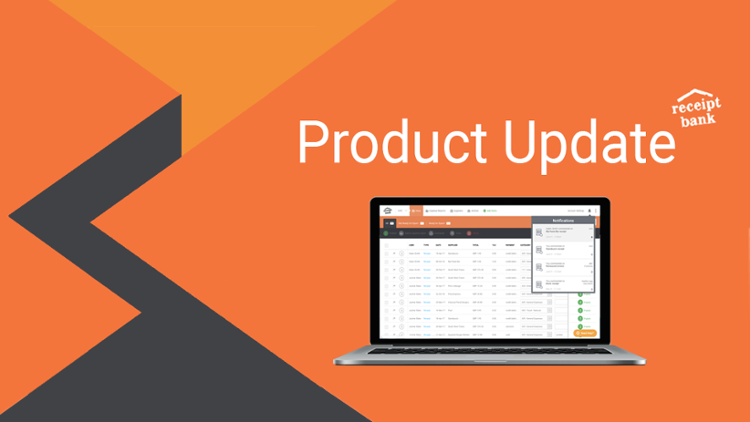 Optimise the efficiency of your firm with the release of Practice View! Practice View offers great insights into the performance of your entire bookkeeping operation. You can maximise the output of your team by monitoring efficiency at firm level to identify any issues across your entire client base, in addition to Client View. Following the feedback of our Partners we are excited to announce that the Sage One South Africa integration is now available. Maximise your time saving by integrating your Receipt Bank and Sage One South Africa account. The Android mobile app had been updated for even smoother working performance and increased security. Item messages will now have a timestamp and will be labelled when added to archive. This should make managing item messages easier for your clients. Don’t worry, the iOS update is coming soon! Keep an eye out for the next product update, we will be reviewing the top feature launches of 2017.